My very best memory has to be our spoof of the legendary films of the Nouvelle Vague (New Wave) directors in vogue in the 1960s such as François Truffaut and Jean-Luc Godard, hooking cameras onto the back of their own cars and filming their characters driving through the streets of Paris in real-time. In another fun sequence, we filmed a faux Je t’aime dialogue in a café, parodying the contrived though ostensibly simple dialogues favoured by Godard… It was fun to capture the spirit of those times! 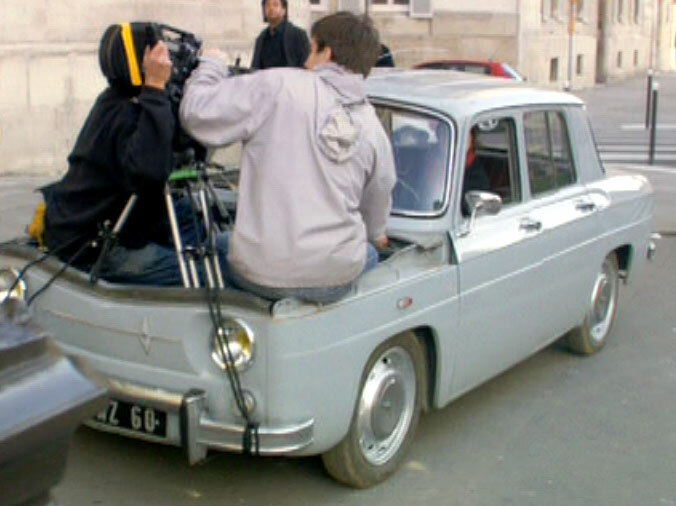 And, as a cinephile, I have to say that’s one of my favourite sequences in the series too… learning about the importance of the Renault 8 (with its back-mounted engine, and front-mounted camera tripod!) is something that has stuck with me ever since. While we’re on the subject, I picked up a book called France in Focus: Film and National Identity (edited by Sue Harris), and I’m looking forward to working my way through that at some point… when I finish the other two or three books I’m supposedly reading at the moment! Sadly it was written before Amélie was released, so there won’t be any analysis of that film’s international sucess, or the controversy surrounding its snubbing by the Cannes selector. Shame. On a more serious tack, it was somehow reassuring to be reminded by this series that many of our most beautiful cities have been plagued by terrible, ugly acts of mob violence in the past… or even razed to the ground completely… but, somehow, the city endures, the scars heal, and the people rebuild, so that new life (and art) can flourish. Coincidentally, Voillet used to work for Artificial Eye, a DVD distributor specialising in foreign-language and art house films, which lost its catalogue of 300 titles in a warehouse fire, during the recent London riots. Obviously that can’t compare to the loss of human lives, but I still feel a little twinge of sadness thinking of all those copies of Kaboom getting burnt to a crisp, before I’d even had a chance to watch the darn thing… perhaps this was God’s way of punishing them for not putting Juno Temple on the cover of the UK edition? This entry was posted in Rants about Films, Rants about TV and tagged Breathless, French cinema, Kaboom, Nouvelle Vague, Paris, Sandrine Voillet. Bookmark the permalink.